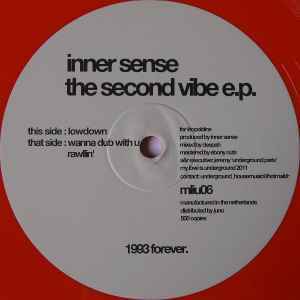 Inner Sense (2) ‎– The Second Vibe E.P. anyone want to part with this please? will pay a good price for it. Nice and very groovy tracks, so reminiscent of the deep stuff that Nervous was putting out in the early 90's, can't help think of the bangin' rhythms of William Rosario and Frankie Feliciano. Really dig this! Relatively new label that keeps pumping record after record of that amazing classic house music sound. Deep, punchy, funky, groovy melodies with occasional vocal samplers. High quality pressings. This is by far my favourite release on the label. If you're into Chicago Deep House sound of the 1990s and/or the New Jersey Garage House sound of early-mid 1990s - I highly recommend this release and the rest of the label.